The glass transition temperature Tg refers to the temperature at which the glass transforms from a lower temperature glassy state to a higher temperature super-cooled liquid state. This behavior shows thermal expansion measurement as a function of temperature. For this measurement, the test specimen is heated at a constant rate of 4°C/min. A differential thermal dilatometer is used for the measurement, as it maintains a uniform temperature distribution within the furnace to ±1°C. 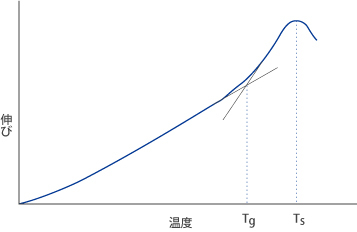 The glass transformation temperature is defined as the intersection of two lines that are extrapolated from the low and high temperature sides, respectively, of this curve,in fig 5. For the high-temperature line, we consider the values at which the gradient is the highest. For the low-temperature line, we determine a value 150°C below Tg. The unit for Tg is °C. The glass viscosity at Ts corresponds to about 1013-1014 dPa  s. Tg serves as a useful benchmark for annealing. The sag temperature, Ts, is defined as the temperature at which thermal expansion1 stops** increasing and actually begins to decrease. The viscosity of the glass at Ts corresponds to about 1010-1011dPa  s.
**This phenomenon does not demonstrate the thermal expansion property essential to glass. That occurs as a deformation caused by the load applied to the glass specimen and the dead weight of the glass. The coefficient of thermal expansion is indicated by αn (for the normal temperature range : -30°C - +70°C) and αh (for the high temperature range: +100°C - +300°C), respectively, and expressed by 10-7/°C. An interference-dilatometer for αn and a differential thermal dilatometer for αh are used as measurement instruments. The coefficient of thermal expansion αn and αh are obtained by the next formula. Where, dTn is temperature difference of -30 - 70°C (K), L is the initial length of the sample (mm) and dLn is the amount (mm) of the change of the sample length from -30°C - 70°C. Where, dTh is temperature differenceof 100 - 300°C (K), L is the initial length of the sample (mm) and dLh is the amount (mm) of the change of the sample length from 100°C - 300°C. The strain point, T1014.5, represents a temperature at which internal stresses in a glass are relieved after a few hours. The viscosity of the glass at that temperature corresponds to about 1014.5dPas. It is measured by the method of regulations by JIS R3103-02:2001. The annealing point, T1013, represents a temperature at which internal stresses in a glass are relieved after a few minutes. The viscosity of the glass at that temperature corresponds to about 1013dPas. It is thought to be the temperature** equivalent to a viscosity of about 107.6 dPas where the glass starts to soften remarkably under its own weight. Also known as the Littleton Point. The coefficient of thermal conductivity (λ) is a value in which the heat flow rate density (heat flow velocity) is divided by the temperature gradient. That is, the calorie that moves through the unit area at the unit time is divided by temperatures difference for each unit distance It is shown it by the unit of W / (m  K). Specific heat (Cp) is a value in which thermal capacity is divided by mass. That is, the calorie that requires it to raise the temperature of the material of the unit mass at 1°C. It is shown by the unit of kJ/(kgK).